When Being a Woman Represents a Major Risk of Commuting Accidents? Since 2010, National Institute for Insurance against Accidents at Work (INAIL) recognized commuting accidents as work injury. Commuting is the leading cause of death among Italian and immigrant women. Commuting disabilities have been studied from INAIL records within the last five years (2012–2016). Results show how women present more disabilities in commuting than men (53.2% vs 46.8% men, p < 0,001). Men show more disabilities due to commuting with vehicle (39.8% vs 36.8% women) while commuting without vehicle is more frequent among women (16.4% vs 7% men, p < 0,05) with more permanent disabilities and severe ones (20.4% vs 9% men, p < 0.001; severe 16.5% vs 7.2% men, p < 0,001). Skeleton-motor apparatus is the most affected among women (87.7% vs 80.7% men, p < 0.001) in all work injury disabilities. Lower limbs are the women body site mainly injured (40.4% women vs 38.6% men, p < 0.01) after upper limbs. More disabilities due to commuting, particularly without vehicle, can be explained with women more home-work-home walking together with double burden, low socio-economic status, work and environmental conditions. 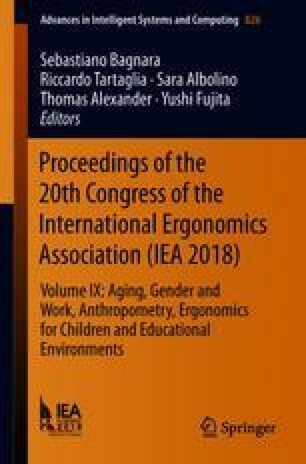 Ergonomics should deal towards commuting gender-oriented prevention, in terms of home-work-home journey concept (sidewalks, lighting, etc), work organization (family/work balance, flexible working hours, limited night shift work, standing and sitting posture, dual tasks, etc. ), specific women’s health prevention (osteoporosis, strengthening lower limbs, wearing suitable shoes for walking and working, etc. ).